In the DiMAGE V, Minolta combines point-and-shoot simplicity, modular lens design, thoughtful touches such as (literally) flexible storage media and the convenience of AA battery power to create a truly compelling photographic package for photographers of all types. From landscapes to family gatherings, the DiMAGE V is up to the task to help you capture the most of your moments in stunning 0.33MP detail. Younger photographers in particular will appreciate that the lens can swivel back towards you, making selfies just as easy as they are with your smartphone. The DiMAGE V sits comfortably in the hand, thanks to a ridge on the front of the camera and an indent for your thumb on the rear. The rotating lens does, of course, encourage two-handed operation, and the smooth action of the manual zoom lever is a joy. A small door on the bottom of the camera prevents accidental operation of the 'Format,' 'Date' and 'Self-Timer' options, because we all know that accidentally enabling the self-timer results in many a photographer hurling their camera into the nearest body of water in frustration. The rear screen does an excellent job of giving you a general idea of what your photo may look like, without giving you enough detail to ruin the 'moment of discovery' when you load it up on (preferably) an old Trinitron CRT. The '+' and '-' buttons not only control exposure compensation, but also navigating images in 'Play' mode. This door prevents accidental operation, and will never, ever break, just like all of these little types of doors on '90s electronics. Operation of the camera is as straightforward as can be. 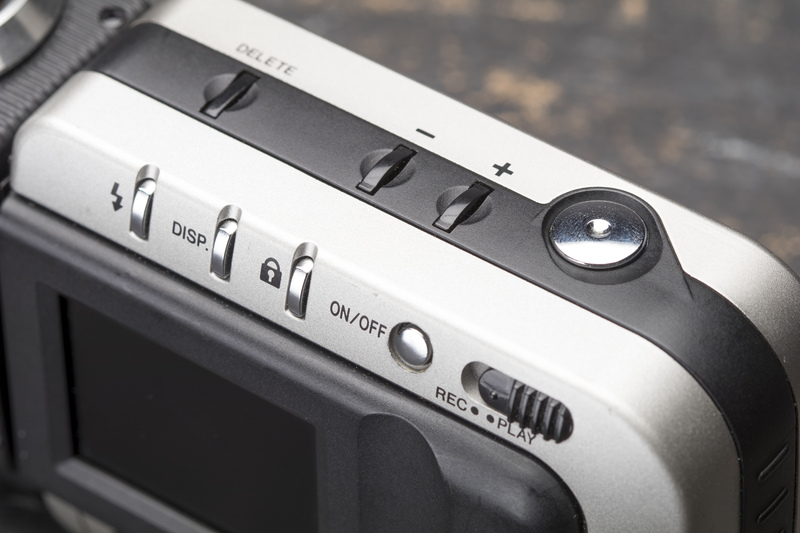 The shutter button is in a nice spot, and the plus and minus buttons on the top give you control over exposure compensation and let you scroll through your images in playback mode. The built-in flash will be especially handy for when the light starts to drop, and the camera's 1/30 maximum shutter speed won't quite cut it. And to keep you focused on the actual process of taking pictures, there is no provision for manually selecting exposure settings. So, does anyone out there have a Smart Media reader compatible with older 5v cards? Asking for a friend. Lastly, the DiMAGE V runs on easy-to-find AA batteries, a blessing as you'll be going through quite a few of them. It uses Smart Media storage, and will only accept cards up to 4MB - this thoughtful touch keeps you from over-shooting and having far too many images to go through on your OG Pentium-powered machine. In terms of performance, the DiMAGE V start-up time helpfully gives you plenty of time to think about the shot you're going to take, and whether you really do want to take it. Likewise for shot-to-shot times. This careful slowing-down of the photographic process does, of course, encourage comparisons with Leica's lineup of digital rangefinders, though we think the DiMAGE is the more practical option for most people. Ah, the moment I know you've all been waiting for. Unfortunately, this is just a hands-on review. 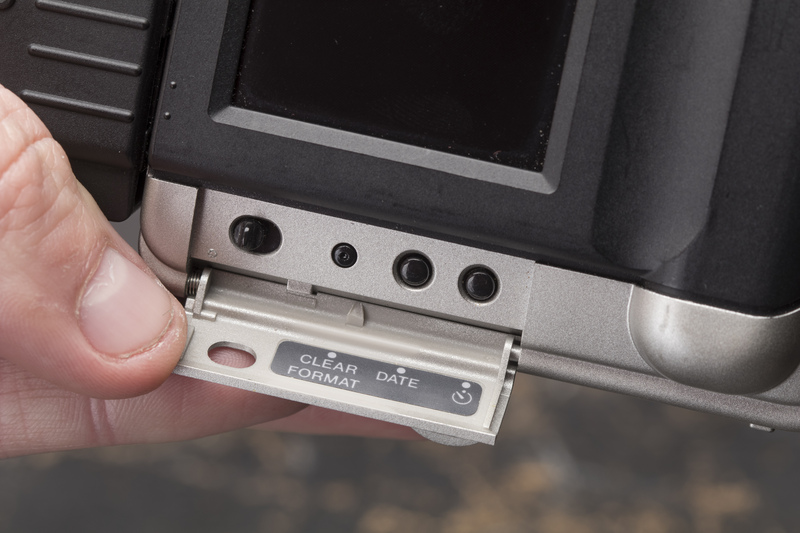 We weren't able to retrieve files from our DiMAGE V, owing to the scant availability of compatible card readers, but we've done the next best thing - we've photographed the rear of the camera so you can get an idea of how effective its screen is. Once we source a card reader, we'll update the story so you can have your own 'moment of discovery' and see the full, glorious 0.33MP files that you crave. As you can see, the DiMAGE looks like it's exposing the daylight scene fairly well without having to use exposure compensation. Colors look a bit cool, but we can't say for sure whether it's the screen or not - and certainly, there is no provision for custom white balance, to keep things simpler for the user. Switch over to low light, and... well, perhaps it's best to just not to shoot in low light. The DiMAGE's zoom range is fairly flexible, ranging from 34-92mm equivalent. Though the start of its zoom range isn't all that wide, fans of Fujifilm's X100 series - with its fixed 35mm lens - will likely see no problem with this. And thanks to the unusual design of the lens, you can even use the optical zoom while taking selfies. This is going to be great for those looking to spice up their Instagram feed with some more avant-garde compositions. Finally, we are big fans of the exposure compensation option on the DiMAGE. It really does give you wide latitude to adjust your exposure to your liking, particularly if you're looking for a more silhouetted look. 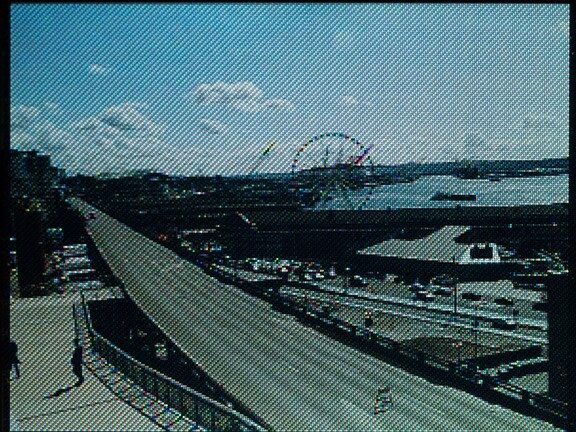 Though it's difficult to see on the rear screen, it did help to bring back the Seattle wheel through the windows for this shot. 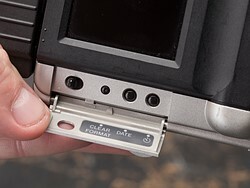 It does detach, and you can even then use the camera itself as an off camera flash. This is something I was really looking forward to testing, but unfortunately, connector cables from the lens to the camera are harder to find than 5v Smart Media readers. 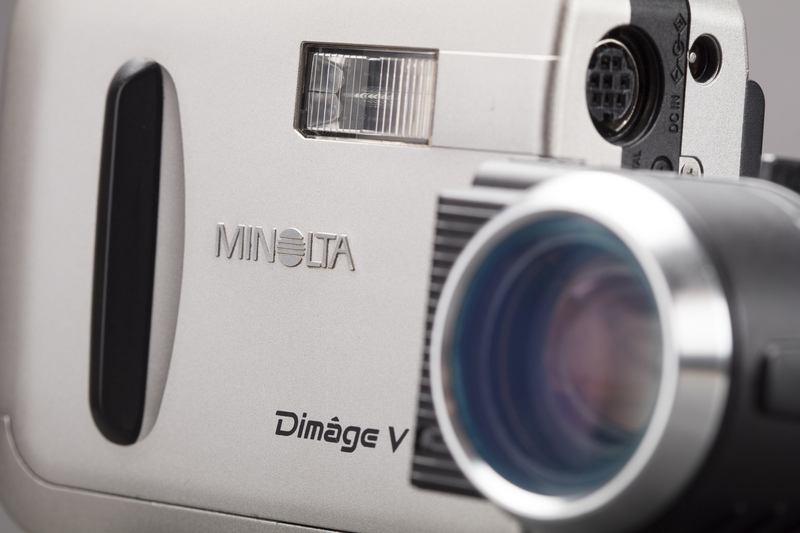 So, who is the Minolta DiMAGE V for? 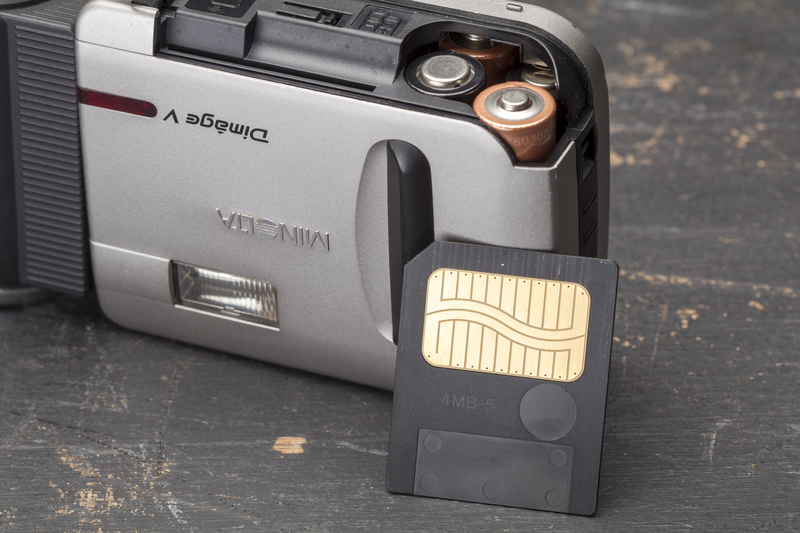 Well, while it's tempting to say it's great for anyone with fifty bucks and an eBay account, you may actually spend more money on and have a harder time finding the requisite memory card reader. But that said, we have to say we find the concept to be a bit of fresh air, even in 2019. 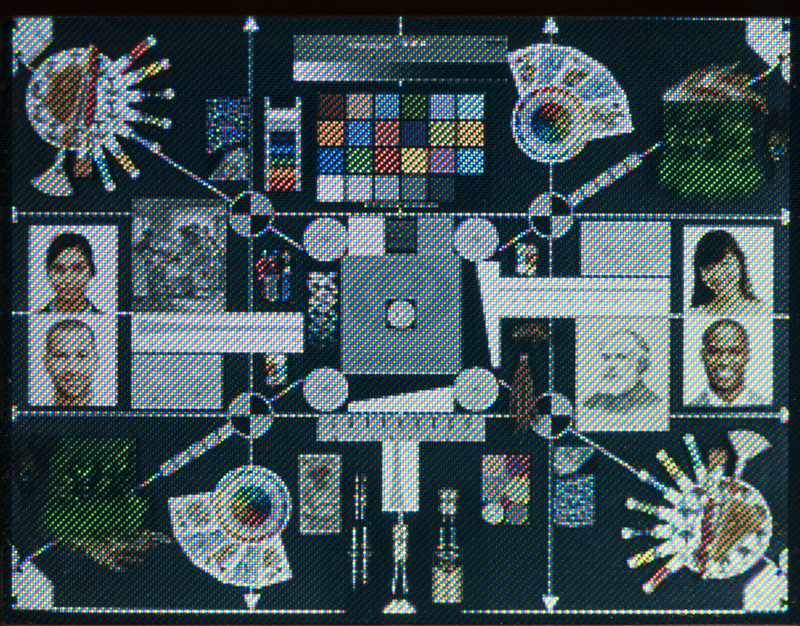 There's no denying that cameras these days are ludicrously more capable and more responsive, but designs are nowhere near as neat as some cameras seen in the early days of digital imaging. 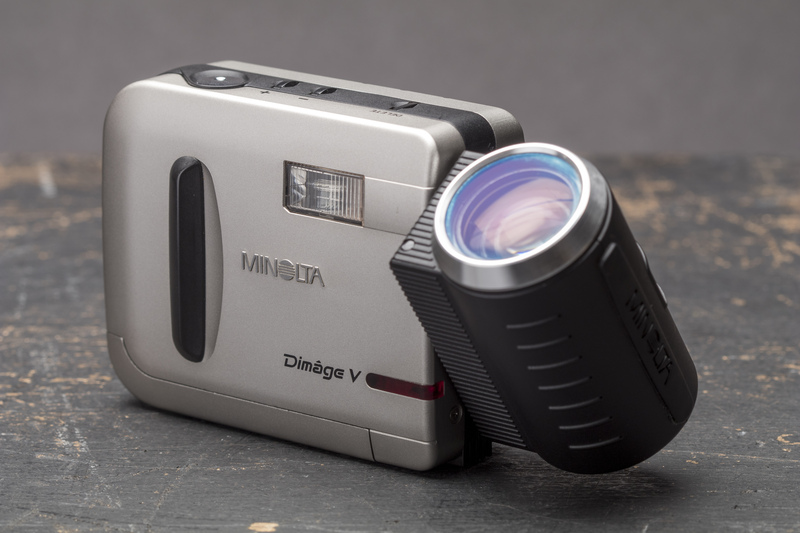 Today, the DiMAGE remains a fun-to-use novelty thanks to the detachable / swiveling lens design. And later in the week, we promise we'll get back to some reviews of, well, modern cameras. Happy April Fool's day, and H/T to our newest developer for generously loaning me his first ever digital camera. Editor's note - an earlier version of this article claimed incorrectly that the DiMAGE V has 3.3MP of resolution. It actually has 0.33MP - we regret the error. To me was a crazy and ridiculous statement already 25 years ago, as calling Professional all the similar digital cameras of the other brands, Kodak, Nikon, Apple, etc. even for the others subsequent, with 1 or 2 Mpx. As often happens, this is the free shameless blah! blah! of the marketing. Loved this camera when it came out... definitely on my wish list of the day. 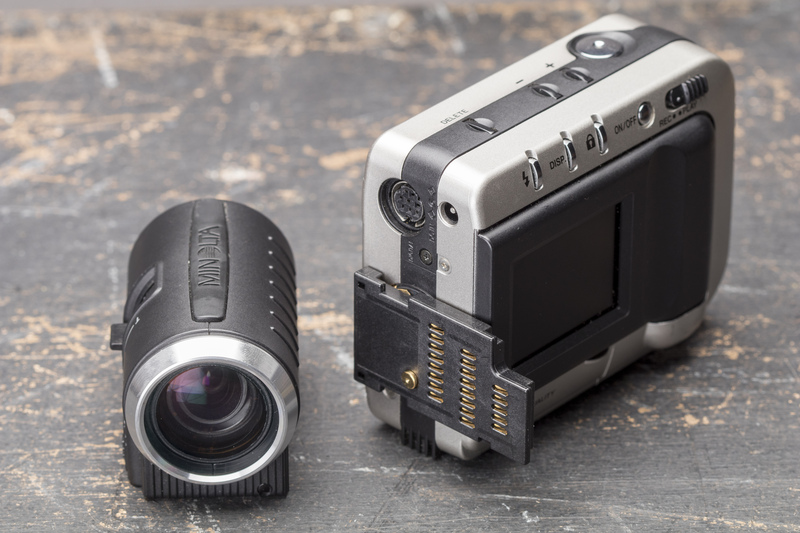 Modern p&S cameras could take a lesson from the form factor too. Thank you for that review. I read it when it came out (or at least, looked at the images accompanying the article) when I was on a nostalgia trip about that old Dimage that I bought in 1997. Unfortunately, I left the batteries in, and they corroded and destroyed the camera. What I remember about it. 1. It would get hot quickly, from the inefficient, power hungry chips of those days. 2. It went through batteries very , very fast. DxoMark will publish a lens review in one month. ...or Apr. 1st next year. 😂 happy April Fools to you too! 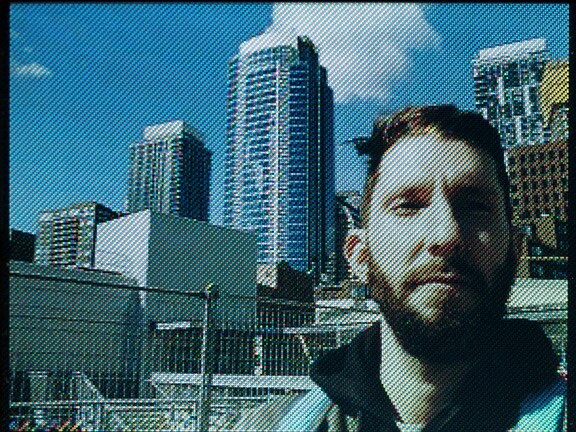 This camera can never have Moiré pattern issue! Guys, this is your best review ever! I have an Olympus C-2040Z that you can borrow and connect to your computer with USB to read the card. Send me your address! You really had me for a minute! Okay, maybe a minute and a half. The delay in testing this camera gives me an idea how long it will take DPR to review Pentax’s Astrotracer feature. The Astrotracer was introduced in 2011 so it is about eight years and no sign of a review yet. @bladerunner there are plenty of astrotracer tests around and i could provide you some samples too if you are really interested. I have come to the conclusion that dpreview will never test not look with good eyes features that are not available on bigger brands. So, i just go somewhere else for that. I have an old smart card reader around here somewhere. My Dimage A1 was still the best camera I've ever owned, for its time. Still more dynamic range than the RP. 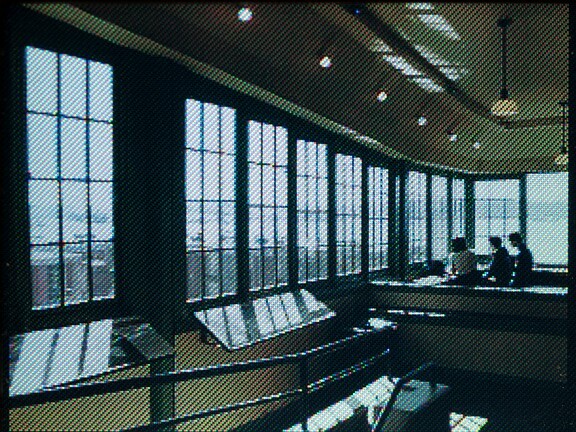 why make the images look like bad screen captures from a 1962 cathode ray tube ? no need to make an avg 640 x 480 .33 mp jpeg look worse .... at its native resolution or on a phone it looks halfway decent .....unlike the parody photo...or were other points being made ? 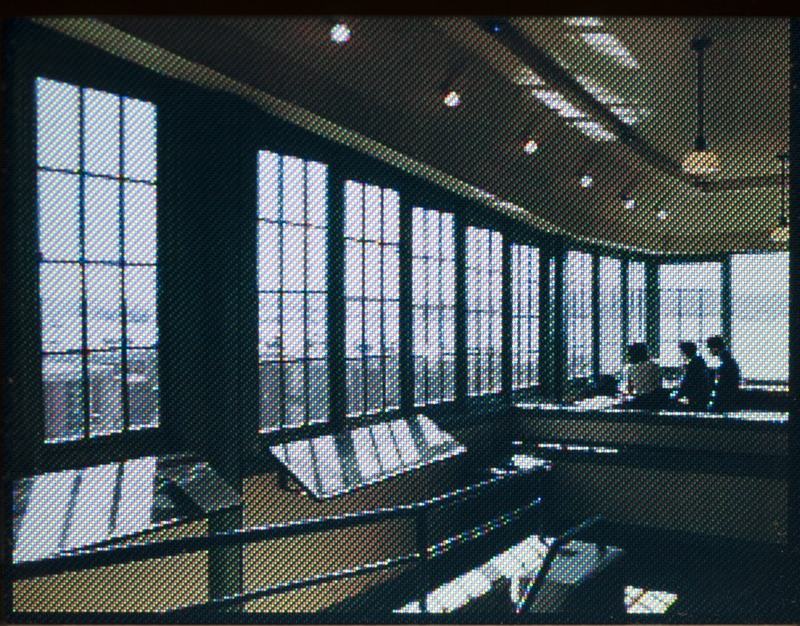 They didn't have a smart card reader so they could not use images from the camera. Those are shots off the LCD... April Fools! And to think, last week I discovered a smart card reader in a drawer and threw it away. My SCSI cables are next to go. Very impressed with the above image samples . This was one of my first digital cameras - in good light it could take pretty good pics (well for the time they were anyway) albeit at a very low resolution. I remember the memory cards being very expensive at the time. Then the Nikon Coolpix 900 series came out & I quickly ditched the Minolta in favour of Nikon. No way. 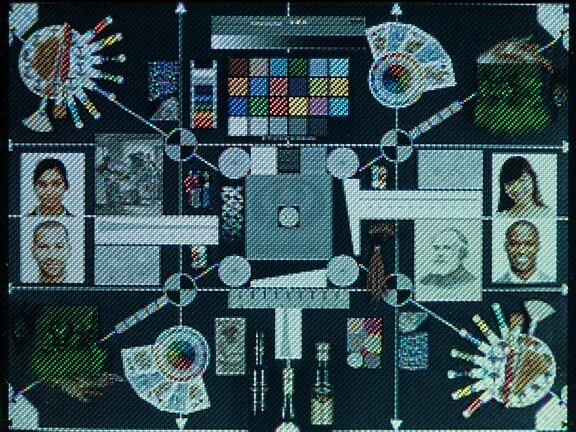 Sony uses the MINOLTA colors. 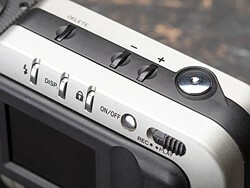 After all, the Minolta DNA vaulted Sony into the NEX, and A7/A9 systems. I expected something like this, but thought it might be a Sony Mavica. I still have mine and the floppies still work. It's a classic. We have an FD-91 kicking around, and it's so silly and so fun. I still have my Mavica, but the battery is dying, dammit. Kinda ironic that the review has 24mp images of a 0.33mp camera. I still have an Olympus not much newer than this. 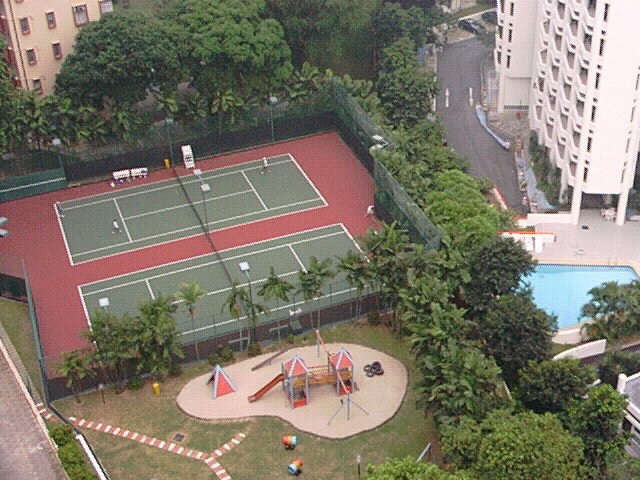 1.2mp, I think, and uses Smartmedia as well. Must be a low light monster. useful for smartphones with zooms. It worked perfectly on the Nikon Coolpix 4500.
someone, somewhere read this article & right now is putting together a Kickstarter scam! Makes Canon sensors look good. I buy anything that DPR recommends. Looking for one of these gems on eBay right now! this April fool's joke was extremely boring and trivial. "It completely fooled me and I'm feeling very embarrassed...."
Whopping 0.33MP of resolution. LOL. Do Americans do April fools day too, like us Brits? Otherwise that and showing us images from its screen is a new low. The way DPR is dumbing down these days, you have to wonder. This entire review is an April Fools joke. Yes. Yes, we Yanks observe it too. The British empire didn't invent everything. By Steven Lee Myers and Abby Goodnough April 1, 2019"
Also "China suspends U.S. tariffs ahead of trade talks. Yahoo Finance Video	Yahoo Finance Video April 1, 2019"
no matter what is still coming this is definitely the best review of 2019. Well, it's not for everybody, but its 0.3mp resolution is absolutely perfect for those who view all of their images on tiny 5-6 inch screens. I see a lot of those people, so this should fit their mentality and sell well. But how big is a VGA pic on a 500ppi screen? Those tiny screens are always adjusting high res pics to fit. Why can't they do the same with low res? The listing does not state that it will read 5V cards though, so might not. Newer cards were 3.3V. And Circuit City only sells the 3.3v(found out the hard way). Love Minolta lenses. If this was an ILC, I would have clicked the Buy button. Throw away the body and keep the lens. Shame on Amazon for not carrying this beauty. I wouldn't have ordered one. DPR never disappoints on April 1st. Canon is just a step above, and Samsung is. Just even. Stopping to read it is what wasted my time. Franz I agree it was a humorless comment, and that’s not my style. But there have been so many parody posts on April 1, that the some total of them has made them tiresome. April fools!! It isn’t a Minolta it is a Sony!! Heh. I was, "Um, what the heck is . . .??? . . . oh yeah; it's April 1." How is the edge sharpness? Does the bokeh have onion rings? How does it feel in the hands? Will there be firmware updates to get me eye-af and animal eye af?